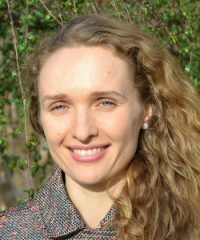 Olena Sambucci is a postdoctoral scholar in the Department of Agricultural and Resource Economics of the University of California, Davis, where she completed her Ph.D. in 2015. Olena’s research focuses on the use of forecasting tools to mitigate production risk from disease in vineyards, and the economic benefits of new vineyard technology. She also spent time researching the structure of the U.S. grape growing industry, with the emphasis on the production and pricing of winegrapes. Olena’s dissertation research examined the use of disease pressure forecasting by grape growers to optimize their pesticide application programs, the effect of continuing education training on grape growers’ management of powdery mildew, and ex-ante economic benefits of an automated powdery mildew sprayer. She was also involved in an SCRI project that focused on breeding grape varieties with improved traits, where she worked on estimating the economic value of powdery mildew resistance, one of the main traits targeted for improvement in new varieties of grapes.